Driving through New York City, President Steve Zervoudis sees Galaxy General Contracting Corporation’s work in each of the five boroughs. And while it’s always nice to remember a job well done, Zervoudis has the added benefit of remembering what many of these homes and mixed-use apartments buildings were like before Galaxy General Contracting came on to the scene. “Some of these neighborhoods were really devastated. In the Bronx, there were blocks and blocks of vacant buildings,” he says. 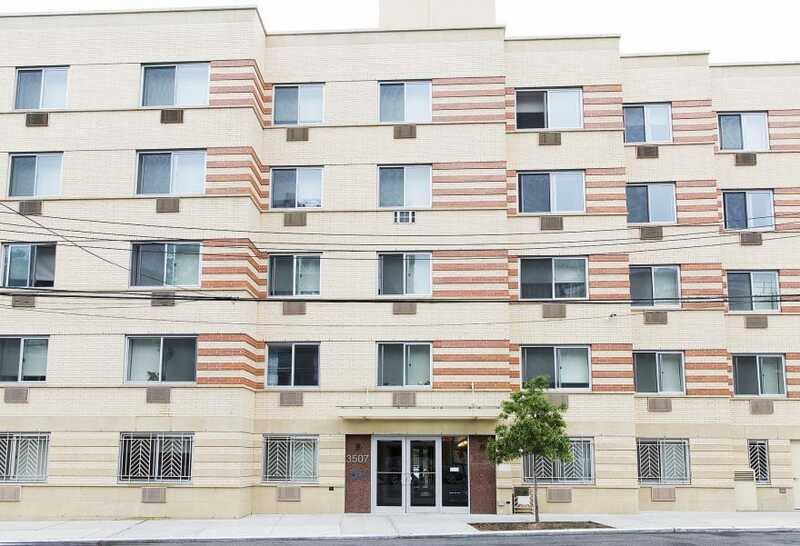 Located on the west side of the Bronx, Galaxy General Contracting Corporation specializes in gut-rehabilitation, new construction and development of affordable housing. Since it was founded in 1981 by Zervoudis, the company has rehabilitated, renovated and built homes and mixed-use apartment complexes in New York City, New Jersey and even Florida. Zervoudis, who runs the company alongside his four sons, Gus, Jimmy, Telly and Ari, still enjoys being active in project management and neighborhood revitalization. 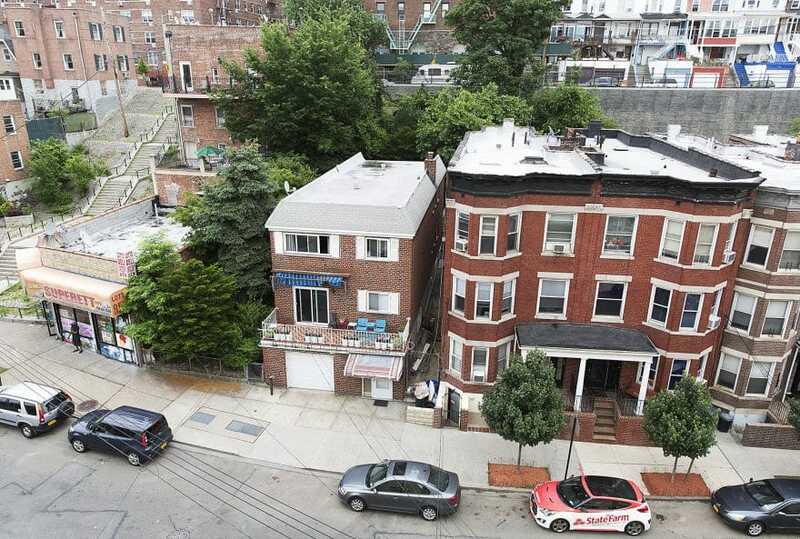 Zervoudis says once, after Galaxy General Contracting finished rehabbing a 54-unit apartment building in the Bronx, the company hosted a barbecue for the neighborhood, attended by over 300 people. “When we look at buildings we did over 20 years ago in the Bronx, Brooklyn and Harlem, we remember what those neighborhoods were like back then. It really shows a transformation, and there’s a real sense of pride that we’ve had a hand in it,” Zervoudis says. 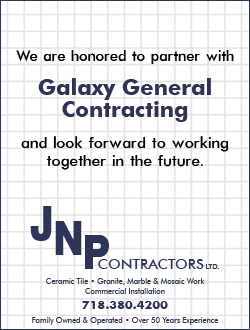 Galaxy General Contracting came to this calling through a series of unplanned yet serendipitous events, says Vice President Richard Sica. Right as Zervoudis started the company in the early ‘80s, the then-mayor of New York City, Ed Koch, developed the Vacant Building Program to sell vacant city-owned buildings to private owners, not private corporations, through the Department of Housing Preservation and Development (HPD). Around the same time, a nonprofit lender, Community Preservation Corporation (CPC), which was established in 1974, was gaining momentum, providing funding and capital for low- and moderate-income housing projects, both solely and in conjunction with HPD. “So you had a new company eager to do business, the capital available to finance the rehab of apartment buildings, and a large inventory to choose from. What a combination,” Sica says. For his part, Zervoudis hit the ground running, buying and rehabilitating homes and apartments both privately and through the Vacant Building Program, all while learning the complex world of funding, or often lack thereof. “Back in the early ‘80s, there were few lenders willing to finance apartment building rehabs, except for CPC, which was a consortium of banks and insurance companies” Sica says. But slowly, other lenders and banks began to see that affordable housing projects came with a very manageable amount of risk. By the late 1990s, even national players such as Bank of America and Chase Bank had set up community development lending organizations. Sica says more funding was also directed toward constructing new apartment buildings. 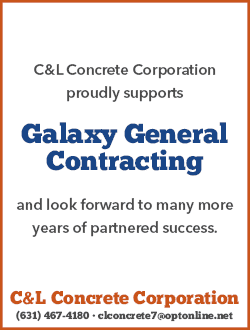 With more funding and resources comes ever-more complicated regulation, and today, Galaxy General Contracting juggles tax abatement programs, tax-exempt bonds, Low Income Housing Tax Credits and numerous city and state housing finance programs. This is all on top of navigating the Department of Buildings examination and approval process. “Each project presents its own unique set of challenges, but because we do this every day it becomes part of our routine,” Sica says. As the company began developing and owning more properties, Zervoudis felt it was time to make a distinction between the general contracting and development sides of his business. In 2008, Zervoudis and his four sons decided to start Galaxy G.C. 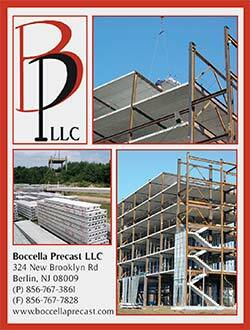 Group LLC, which would act solely as general contractor on third-party projects. 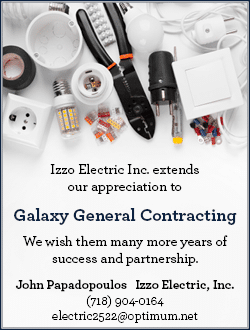 While Zervoudis still owns 100 percent of Galaxy General Contracting, his four sons are the majority owners of Galaxy G.C. Group, which Sica says will ensure the company’s legacy. The group has helped the company take on larger projects, which Zervoudis co-developed, such as the Coney Island Commons. Completed in 2013, the project consisted of two apartment buildings with 195 apartments and a freestanding 42,000-square-foot YMCA. 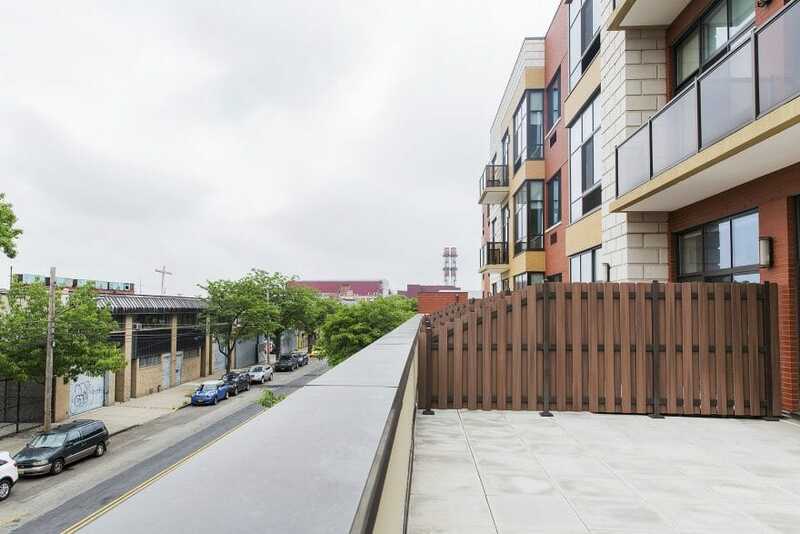 Galaxy General Contracting is also in the process of finishing Stanley Commons, a six-building, 240 apartment project in Brooklyn that also has an 18,000-square-foot community center. 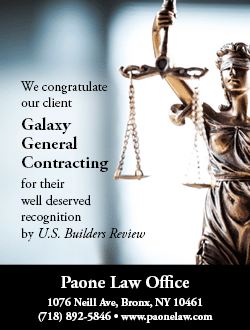 In response to the devastation caused by Superstorm Sandy in 2012, Galaxy General Contracting was selected to develop and construct homes damaged in Brooklyn under HPD’s Build it Back program. Sica says Galaxy was one of only three developers to be chosen. 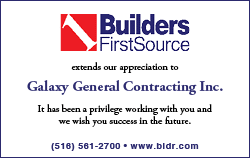 While Zervoudis, his sons, and every employee at Galaxy General Contracting are pleased and proud to have assisted homeowners in their time of need, nothing beats the company’s bread and butter, providing low- and moderate-income families with a beautiful place to live. “When we attend closings for homes and condos we’ve developed, we often deal with first-time home buyers, some of whom get very emotional when we hand them the keys to their new residences. Frequently, we are greeted with teary-eyed buyers giving us hugs and kisses. You can’t help but be moved by that,” Sica says.